WestConnex holds the dubious honour of ‘largest urban tollway construction project in the southern hemisphere’ at a time when most cities across the globe are tearing down their inner-city motorways because they’ve proven to be counterproductive. The $16.8 billion project - a 33km largely-underground network of private tollways that the NSW government is building around Sydney at immense cost to taxpayers and the environment - is not yet fully funded. Its business model is reliant upon large tolls being extracted by private consortia (which the NSW government guarantees against loss). No profits will flow back to NSW taxpayers. 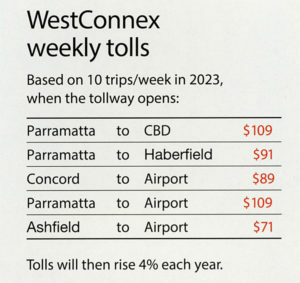 Tolls on the M4 (being re-introduced to help fund WestConnex) will herald this expensive new era of motoring for Sydney. 'Rat running' (drivers taking everyday roads to avoid tolls) will become prevalent. WestConnex has already created havoc across many parts of the Inner West (most notably in Haberfield and St Peters). The project is only 24% complete. Tunnelling, traffic disruption, pollution, the destruction of homes, businesses, communities, natural environments and heritage is proposed to continue until 2023. Commuters would then be tolled $27/day to travel from Parramatta to the CBD … 62% of those surveyed in Parramatta (ReachTEL 7|16) stated they would prefer to see the $16.8 billion WestConnex budget spent on public transport. See Toll Calculator to calculate how much you will pay. Most countries have ceased bringing motor traffic into their city centres. In Seoul (see image above), an elevated inner-city motorway (built in 1976) was removed in 2003, and replaced with public gardens and waterways. In January 2017 the mayor of Paris unveiled plans to restrict traffic and to pedestrianise the city centre in an attempt to halve the number of private cars on the road, and reduce pollution. A high proportion of credible traffic/planning professionals believe that WestConnex is a white elephant which simply won't work, and that the NSW Government should instead divert funding toward the provision of integrated 21st-century public transport solutions for Sydney. In February 2017, after a lengthy investigation, Federal Auditor-General Grant Hehir delivered a scathing Report re WestConnex's financials. He concluded that the Federal Government's commitment of $3.5 billion to the project (including a $2 billion low-interest loan to the NSW Government) had not been properly assessed, and that the overly hasty approval of funds had also failed in its stated aim of speeding the project up (see also LINKS for media response). 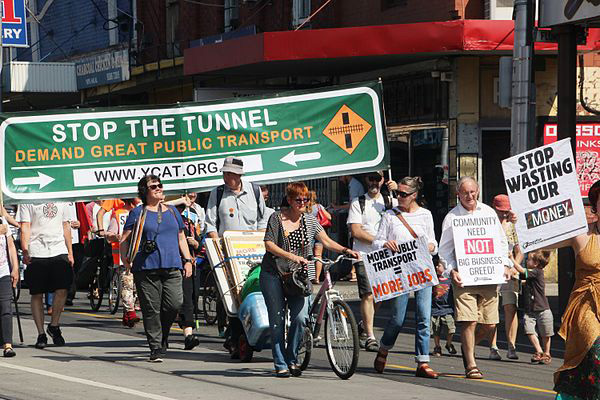 Melbourne's proposed $18 billion East West Link (a tollway project similar to WestConnex) was scrapped in late 2014 in favour of rail transport by Victoria's incoming Labor government. This turnaround in public policy required 18 months of vigorous and sustained community protest, and an election. The documentary film Tunnel Vision (2016) chronicles that struggle. Perth’s controversial $1.9 billion Roe8 Freight Link tollway proposal met a similar fate at the WA state elections in March 2017, and is now officially defunct. 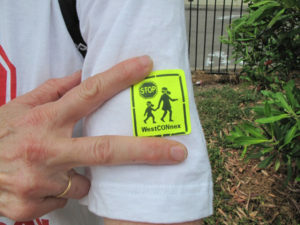 There are currently 15 resident action groups across Sydney working together to halt WestConnex. Drill-rig protests and Non-Violent Direct Action (e.g. sit-ins, lock-ons, tree sits) have become prevalent over the past year. Such 'actions'/delaying tactics are set to further escalate in 2017. See, for example No WestConnex: Public Transport (NOW-PT), WestCONnex Action Group (WAG), and Leichhardt Against WestConnex (LAW). 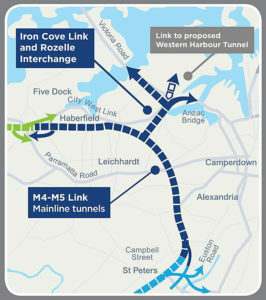 Stage 3 of WestConnex - the M4-M5 Link - proposes tollway tunnels linking Haberfield (M4) and an interchange to be constructed on parts of Sydney Park in St Peters (M5), via a Rozelle Interchange on and beneath the current Rozelle Goods Yards site. The Rozelle Interchange proposes to link east to the Anzac Bridge (20,000 extra cars/day), west to Victoria Road via a 4-lane Iron Cove Link tunnel beneath Denison and Darling Streets, with portals near Terry Street/Callan St, and north via a Western Harbour Tunnel beneath the Balmain peninsular towards Lane Cove. 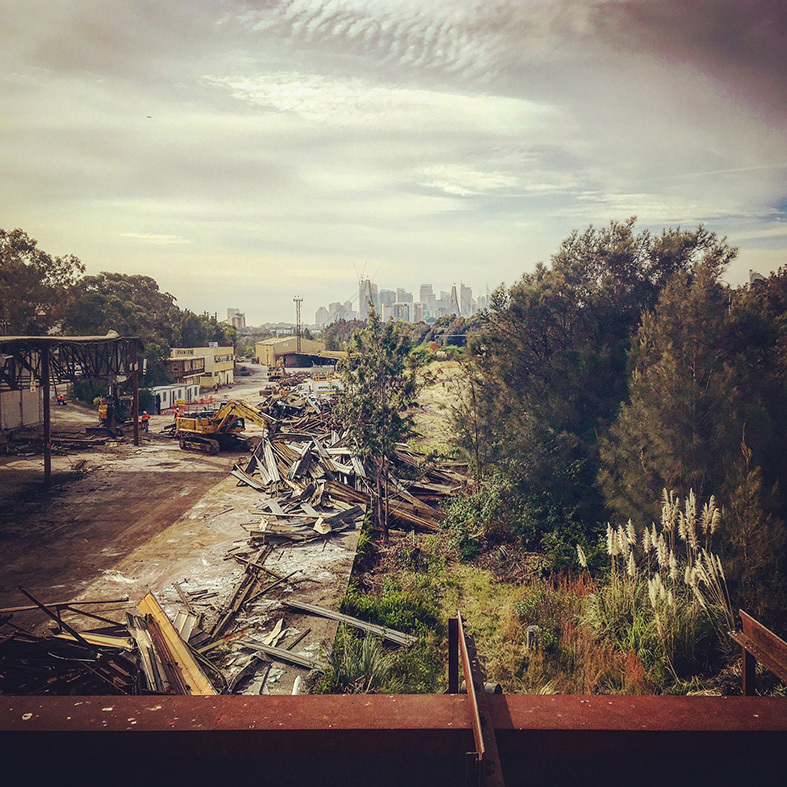 To construct the Iron Cove Link tunnel, WestConnex proposes to acquire and demolish 27 homes and businesses along the western side of Victoria Road between Springside Street and the Iron Cove Bridge. 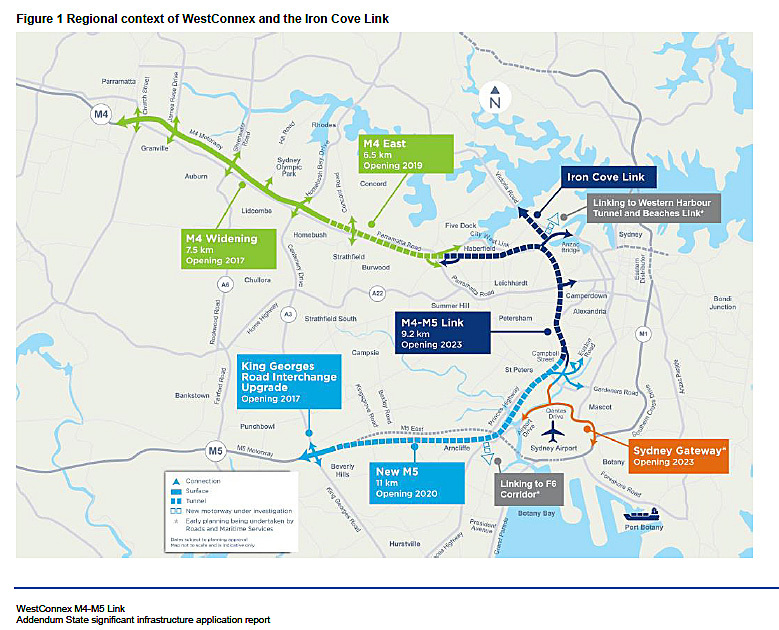 WestConnex's own literature states that the proposed tunnel may result in increased traffic congestion at Iron Cove Bridge (already a bottle-neck) at peak times. See M4-M5 Link Addendum September 2016, p.8. Tunnel portals for the proposed Iron Cove Link would be constructed in the vicinity of Terry Street and Callan Street, Rozelle. Their 12-metre-high exhaust stacks would not be filtered. Existing pollution monitoring equipment is incapable of measuring the most dangerous cancer-causing particles from exhaust emissions (< 2.5 microns). The only Rozelle air-quality monitor is located under a tree in Callan Park. Late last year another was installed beside the City West Link at White Bay. The next closest one is in Lindfield. To construct the mooted Rozelle Interchange, WestConnex proposes to tear up existing rail infrastructure in the Rozelle Goods Yards, thus scuppering any potential for light rail to be re-introduced within the Bays precinct/onto the Balmain peninsular.